Chris has 35 years’ experience in the audio industry, specialising in audio post-production and location sound recording. 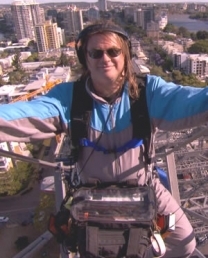 A proud member of the Australian Screen Sound Guild, Chris has received nominations for and has won AACTA and ASSG awards for best sound in a documentary. These compliment his local and international awards for sound design in both TV and advertising. His up to the minute equipment list including a 12 track field recorder, a variety of high tech wireless and recording equipment and an ever increasing collection of beautiful microphones, ensures that the right sounds are captured in the field and having spent half his life in post production, Chris knows what is needed back in the studio to make your production complete. Chris prides himself on his easy going nature, professional approach and years of experience to make the process of sound recording in the field a pleasure. Available in Sydney, Gold Coast and Brisbane and of course happy to travel to exotic destinations to get the job done! I have had the pleasure to work with Chris on many projects. I always find his professionalism, attention to detail and work ethic are of an extremely high standard. Chris is personable and out going, and always willing to help in any way to deliver the best product for the client. Chris is always a pleasure to have on the team. Super professional and a great guy with positive attitude and easygoing nature. Chris’ role meant he was working closely with high profile musicians and performers in a high octane environment, yet he gets along with everyone and gets the job done without any fuss. I look forward to working with Chris again on the next gig. Chris is always a pleasure to work with! On set and for my voice overs. Without a doubt, one of the very best! We’ve had the pleasure of working with Chris across both Splendour in the Grass and The Falls Music & Arts Festival over the past two years. In addition to his incredible work ethic, Chris is a kind and genuine guy to have around and is without a doubt respected by everyone in our team who’s had the pleasure of working with him. Would highly recommend Chris to anyone – relaxed, funny, professional! What a legend!! I worked closely with Chris across a couple of projects over the past few months. His attention to detail and dedication to the work was second to none, and he brought experience and a high quality of workmanship to the team. I was very impressed by the output of his work, thanks to his strong technical skill and ear for great sound quality. I would most definitely work with and recommend Chris moving forward. We absolutely love having Chris as a part of any production. In addition to being a fantastic soundo, he is easy going, with a great energy and ‘can do’ attitude. We have even grown to like his dad jokes. Chris is an asset to any production, large or small, and always a pleasure to work with. Chris is one of the true gentlemen of our industry and as a sound colleague one that is constantly recognised at the top of the game. He is the consummate professional both by nature and ability and would personally be hard pressed to recommend anyone better as a sound recordist than Chris. Chris is an absolute asset to any production and I would not hesitate to recommend him for any type of project. His abilities, professionalism, knowledge and equipment are exceptional. These qualities, combined with also being the perfect gentleman definitely enhance any production and results in a smoother and more enjoyable environment to work in. Chris has always been one of my favourite people to work with. Knowing that I have him on a job gives me so much confidence in the quality of our output, and he’s simply a pleasure to be around. Through the several years that we’ve worked together, I always look forward to collaborating with him and look forward to enjoying more shoots with him. Chris is an all round good guy, nothing is a problem. He has always supplied great audio in every situation I have worked with him. I’ve had the pleasure of working with Chris over many, many years, in fact it’s safe to say over 20 years. Chris first worked with me as a sound engineer, recording voice overs, track-laying sfx, sound design and crafting the full sound production. Since that time I’ve worked with Chris as a freelance sound recordist, because of his previous technical experience, Chris has a first class understanding of what is required when it comes to recording sound, after all he has worked on both sides of the fence so he knows what his client needs when it comes to the final mix. Beyond his years of experience, he is also just a good bloke, great sense of humour and fits into any environment or team. Chris is smart, quick and a constant professional. I’ve worked with him numerous times on docs for Discovery Channel Canada. He’s the kind of audio tech that is assertive and assesses a situation quickly. He is an asset to have on the crew and having him on my team is one less thing to worry about. I have known and worked with Chris for well over a decade. A total professional and all round top bloke! Voice over producer, post production pro and location sound legend. Chris gets on famously with everyone and no request is ever a problem. He is a great member of any team. Your in best hands hiring Chris for any of your location sound needs. Chris recently worked with Come Alive productions on our China / Australia co-pro on both Chinese and Australian legs. To say the job was challenging with communication and cultural differences is an understatement, yet Chris managed to keep cool and professional while delivering the highest standards at all times. Long hours, difficult locations, language barriers and yet Chris always with a smile! His gear and workmanship is of top quality. I’ll use him again any day. I worked with Chris on a children’s television series which saw us filming in many different locations and evironments all around Australia. Chris is easily one of the most exceptional sound recordists I have ever had the pleasure to work with. He is incredibly organised, professional and proactive, and makes everyone on the shoot feel at ease – both crew and talent alike – thanks to his genuinely friendly and positive manner. If I could choose a dream crew for every shoot I worked on, he would definitely be part of it! I worked with Chris for many years and he has continued to be one of my favourite sound mixers. He has inordinate attention to detail, he is punctual, dedicated and forward thinking. I think Chris becomes an integral part of any team he is working with, and as such he is committed to making sure that every aspect of what he produces for on-air is of a consistent high quality. From liaising with the producers to going above and beyond to make sure what we produce is outstanding on-air product. Chris displays a mature attitude to every aspect of the sound design he provides. Nothing is too much trouble or too miniscule to escape his attention. I always feel “safe” when Chris is mixing for me! If necessary, Chris also directs talent well, whilst showing deference to his clients and still insisting that we adhere to the high standards he displays. He is personable, affable, fun to be around and passionate about sound. I would work with again in a heartbeat. Chris combines his passion for his work with humour and a drive that makes him a much respected and invaluable asset to any crew. Look forward to season two of Surfing The Menu to enjoy the company of this true professional. I have worked with Chris (myself on camera and he on sound) on a two week, around the country, project with a very small crew (myself with Chris and the director/producer) and found the experience all the better for having Chris as our soundo. Chris was very Professional, very experienced and very respectful of myself being least experienced of the party and always willing to help and guide where possible. Since, I have found I have always looked back at Chris as a very good example of a good crew member and since taking on my own projects with other sound recordists I value that experience with Chris and would use him more, if we were less than 2500 kms from each other, for sure! Chris is not only a great Soundo, but an excellent human being as well. I am a DP with over 20 years experience working with companies such as National Geographic, Discovery Channel, the BBC and others. I have worked with Chris on a number of productions to date. Chris is without a doubt up there with the top engineer/sound recordists I’ve worked with. Single or multi camera, lifestyle, doc or drama, Chris is comfortable with all. He is a great professional and his work is invariably top notch. Nothing is too much trouble for him and he has dug a few productions I’m familiar with out of bother. Its always great when you get a combination of skill/professionalism and good character in a fellow professional. Jobs can be hard sometimes but having Chris around invariably made my work easier and I know from feedback producers and directors were always happy they hired him. He is a benefit to any production and I would have no hesitation in recommending him. I had the pleasure of flying overseas to Australia and working with Chris for a duration of 7 weeks. I could not have asked for a more professional, dedicated and friendly sound recordist during the period of the shoot. Chris has a very calm and collected approach to his work, making him a great asset to any production or team when things get ‘busy’ or ‘stressful’ as we all know too well in this industry. A true professional and great to work with! Chris McCallum was the Audio Engineer on a 13-part TV series (Surfing The Menu: Next Generation) that I was Line Producer on. He is an incredibly passionate man when it comes his craft, and his skills are beyond reproach. I was never in any doubt that he was going beyond and above to get his job done, and done to an exceptionally high standard. The shoot in question involved filming on a long road trip through challenging and remote parts of Australia. This is when Chris’ personality and ‘can do’ attitude came to the fore. He is a problem solver, very easy to get along with, and has a great sense of humour. He engaged exceptionally well with all members of the crew, and helped forge a strong sense of camaraderie. Chris played an integral role in making the shoot both successful and enjoyable, and I would not hesitate in recommending him for other productions. Chris is a good guy and good operator. We have had to work in very delicate situations such as elderly people with dementia In care facilities and also regular environments where good sound can be a challenge. Chris is across what needs to happen to help the day run smoothly. I recommend him highly. We have had to shoot 5d, C300, and also XD Cam PVW 700. Nothing is a drama for him. We have used Chris on a number of our productions and cannot recommend him enough. Chris is a first class sound recordist and an asset to any production. His sounds skills are matched by his attitude, flexibility and persona. With a busy and changing schedule, Chris constantly adapted and did so with a smile on his face. More importantly on the road, he is good fun to have around. Chris is our first choice sound man on all jobs. My company is Multimac Media and we have worked with Chris for many years now and he has been a great team player who has shown professional skills and flexibility within all projects. He has the latest in cutting edge gear that has saved some of our shoots and that is priceless. I would recommend Chris for any future project small or large. I have known Chris for well over a decade now. 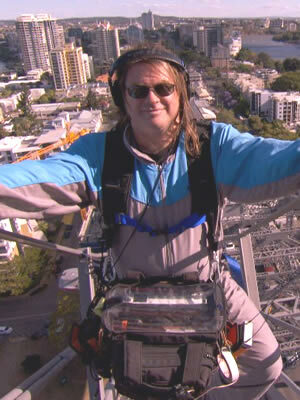 I have worked with him on countless reality shows here in Australia as well as several Doco’s and high Corperate shoots. His work is always first rate, as is his equipment. Chris is also great with talent and producers, which makes for a comfortable shooting environent. Chris is a thorough professional and one of the nicest people around. Very knowledgeable with gear and technique. great gear and more stories than Jackie Collins, Chris is a delight on location and in the studio. Don’t leave home without him. I’ve worked with Chris on a number of productions as a presenter and producer. His work has always been fantastic and on set his dedication and skills are spot on. His love of gadgets and all things audio is his biggest asset and it is always great working with someone who really loves what they do. I would recommend him highly for anyone’s productions. As a voice over, writer, producer and performer I’ve worked with Chris through most of his career and I see no reason to stop now. His wide range of experience has made him one of those people who has all the bases covered all of the time. His laid back nature belies the fact that nothing gets by him and his attention to detail sets him apart when you’re chasing the shot. He’s a pro. Chris is a professional from start to finish, in every aspect. I’ve worked with Chris on and off for over twenty years. When it comes to audio, he’s a perfectionist and the end result shows it. In the field, I’ve used Chris because I know there’ll never be any audio problems back in the edit suite (something that can happen all too often with other sound recordists). In the studio, Chris’ sound design and mixes are always spot on. Add to all this the fact that he’s incredibly lovely and easy to work with and you’ve got the perfect guy for any and all aspects of audio production. I can’t recommend him highly enough. I’ve known Chris for over 20 years having met him in radio where his great reputation preceded him. We have since worked in post (I’m a voice actor) and also on location (TV) where it pays to have someone you trust shoving a mic up your dress! I’m now based in LA and Chris is my go to for any sound queries I have, from choosing the appropriate equipment (onsite interviews, to shooting webisodes) to finessing tracks for clients (voice acting, Pro tools) in post. I have no hesitation in recommending him for your work. It should go without saying at his level of the biz, but he’s honest, kind, goes the extra mile, has a great attitude and does brilliant work. Great guy, super efficient, got all the gear, easy to get along with and the clients love him. Never had a hiccup or problem with Chris’s work I’ve worked him in the jungles of a Reality Show to ACA to commercials. Always happy to work with him. We have worked with Chris on a number of jobs, ranging from television to corporate. Chris has a great collection of kit, and always has something on hand to get us out of a bind. He’s great to work with, has an excellent work ethic, and his sense of humour makes him not too annoying to have around. The only problem we have had with Chris is trying to get him to keep his clothes on during the shoot. Once that little, and we mean little, problem is overcome, we’d recommend him unreservedly. And besides, he offered us a 15% discount off our next booking if we said something nice about him. Job done. Chris is a model of professionalism, and a long-time respecter of we voice artists. I’ve known him since 1984 in his callow radio days, then as a long-time studio engineer before his freelance status. Always a pleasure to work with, especially with his great sense of humour, his work is top notch (and as a sideline he helps grumpy old non-techs like me with websites and tech support). Vale, whoops I mean hail, Chris McCallum! Chris and I have a long working relationship. He has always been one of my favourite audio technicians, making me feel confident and secure and relaxed at work; his high level of experience and competence is reassuring and of course, he has the added bonus of being delightful company!